Micro-learning was the #1 eLearning trend picked by the experts for 2018. Is it just taking a longer course and chunking it into sections? According to micro-learning expert Ray Jimenez, the media you use doesn’t matter. It’s more about going out into the workforce and solving real problems. Based on the advice from Ray, I’ll help you launch your first micro-learning event in under an hour. And now, let’s launch your first microlearning event! Worksheet: Here’s a link to a free micro-learning worksheet to keep you on track. What is micro-learning? Micro-learning is a way of helping workers fix, solve, and improve things at work. It’s a way of learning with answers and solutions. It’s low in effort, easy, fast, and ready to use. And USEFUL. 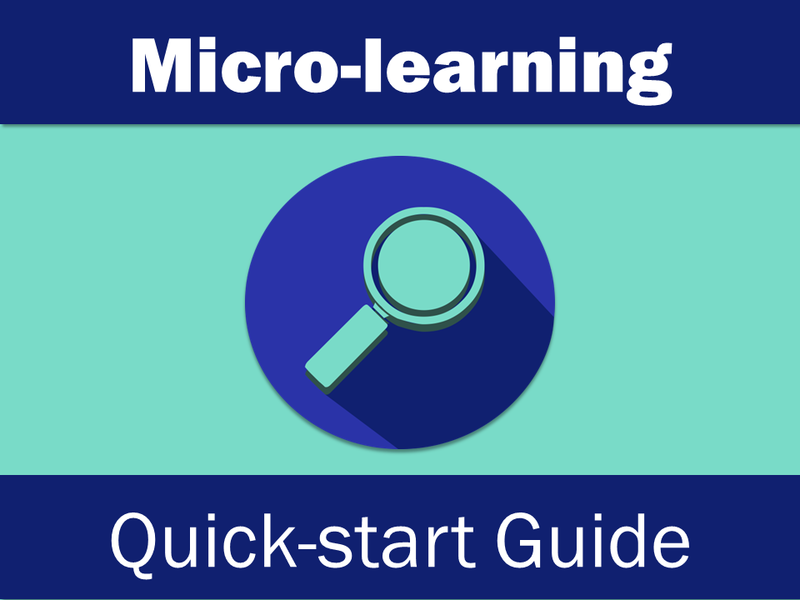 What about all this buzz about micro-learning? There’s too much focus on content, but this is more the classroom approach. Breaking a longer course into smaller “chunks” misses the point of helping REAL people DO things. Micro-learning works best in the real world. What are the benefits of micro-learning? What are the criticisms of micro-learning: That people will not be taught enough info or retain things. But that assumes a “recreated world” (i.e. classroom) that’s about memorizing, not doing. The reality is we only learn by doing small things at a time. You may have attended 1 hour, 1 week, or 1 month course. In practice, you’re not going to apply all the concepts from the course. Micro learning is about what’s useful in that course. What are the best micro-learning tools & platforms? It’s not about the content delivery. It’s about helping people do their jobs. It can be an email, Google Doc, video scenario, mini-scenario, short video, or even a text message. Who to ask: Let’s not start with the CEO just yet. Let’s dip our toes in first. In one of these 3 roles: I can’t think of an organization that doesn’t have operational, sales, or HR functions, so let’s pick an one of these. Have a person (or a group of people) in mind, right it down. Let’s do this! Pick a question topic that can be answered in 50-100 words of text. Not so short that the answer is yes, no, or a single-word response. Not so long that it turns into a 30 minute response or an essay. So… It needs to be specific, but not yes/no. Don’t worry, I have examples below. What’s the biggest pain and how it can be relieved? What’s is working well for them that you can share? What’s your #1 tip, trick, or hack for [INSERT ROLE] to [DOING A SPECIFIC TASK]? What’s the #1 problem you’re running into with selling the [PRODUCT]? What’s your best tip for addressing that with customers? What’s the single best thing you’ve been doing when communicating the [PRODUCT] with customers? If you could go back to your first week on the job as a [INSERT ROLE], what 1 piece of advice would you give yourself? What resource have you found most useful outside of the formal training process? What’s the most painful task to you/HR during the onboarding process? If you could get one message across to everyone during the onboarding process, what would it be? So let’s just assume you’re going to ask the question by email. Later, I’ll show you how you can do fancier things like video. I wouldn’t do much here. But I do like to pull out a single line of text and make it into something more memorable…Like a short quote that summarizes the main point. In my expert roundup posts, I often turn these into image quotes, but you can also just make it text based. Question: What’s your single best tip for creating engaging learning? Note: There are a ton of ways to format this content. I’ll get more into re-purposing this content in the science-based learning tutorial. There are so many ways to distribute content (Google Doc, PDF, KB, text message, video, etc), but let’s not waste time formatting this first version. Let’s just send it out by email. Copy and paste this email and send it out to your organization TODAY. Take a webinar series on micro-learning from Ray. Excellent article. Love the “In the next hour, here’s what you’re going to accomplish:” – so much better than the usual “…what you are going to learn”! All about “doing” – so great to hear.